Do you know what happens with the old mobile phones and tablets within your company? Is your company looking for a reliable partner for the processing of your depreciated mobile phones, tablets and notebooks? A partner who can also ensure that the remaining data is removed appropriately? Someone who can take care of everything and who takes into account your “Corporate Social Responsibility” programme. Whether it is about several dozens or thousands of devices: Ecowave provides customized concepts to regulate this flow of devices responsibly. We offer solutions for both single and structural return flows. Always focused on sustainability and of course 100% safety. The products are processed with the greatest care in accordance with the European Directives. The aim is to re-use the whole product or parts of it. Otherwise, products will be fully recycled in order to re-use the precious raw materials in new products. In this way you will be ensured that no damaging substance will end up into the environment. Of course it is important that all (business sensitive) data of the devices will be completely removed. Ecowave offers several options for this. Next to the standard features of resetting the device to the factory settings, we also make use of certified tools (e.g. used by NATO) to remove data, of which you will receive a certificate for each device. Together we will discuss the current situation and make a proposal, taking into account the integration within your possible “Corporate Social Responsibility” programme. In accordance with the WEEE directives of the European Commission. Detailed reporting and track and trace facilities. Market-based fees for your used devices. When your old devices leave your company you need to be confident that all remaining data is completely erased. Whether your devices are eligible for re-use, or recycling, in both cases it is a pleasant idea that all data is professionally erased. Besides the standard possibilities of a product data erasure, Ecowave also offers certificated methods. 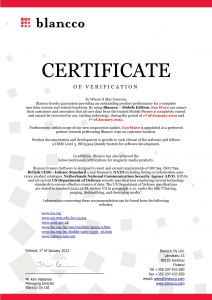 For each device you will receive a certificate as a guarantee. In this way you can entrust your old devices a second life with peace of mind. 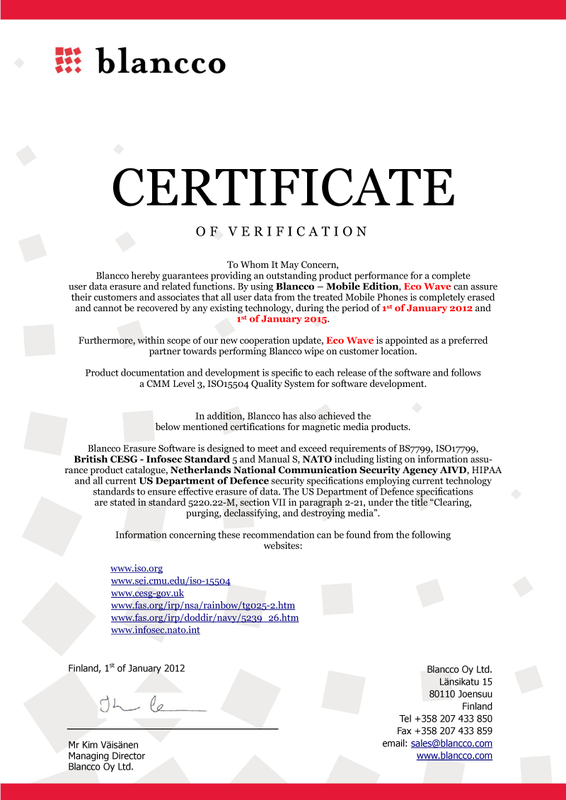 For data erasure Ecowave makes among other use of professional software of Blanco from Finland. Blanco is the worldwide supplier of professional tools for data erasure. You will receive from us a certificate for each device, of which the data is erased. Click on the image below to view a sample. 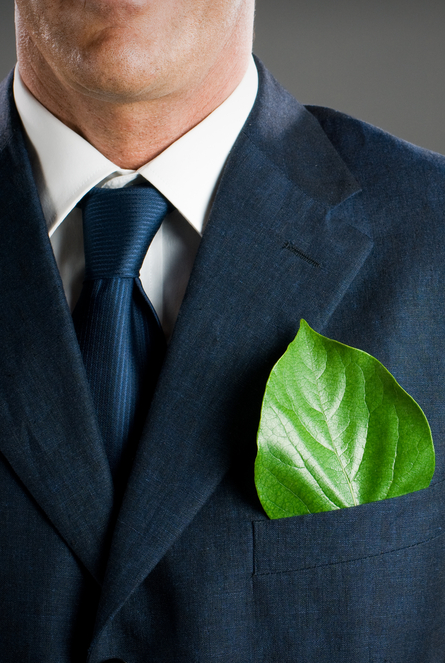 Corporate social responsibility is becoming more and more part of business operations. One category of this is the organization of sustainable waste and return flows. Ecowave helps you with the organization of this flow, when it comes to telecom products, whereby you will also benefit from the attractive fees and excellent service. Usually with sustainable waste and return flows one thinks automatically of recycling. According to the well-known “Lansink’s ladder” re-use is always preferred. Devices, which may be out of date for your company, usually still, can have a technological life of 3 to 4 years. 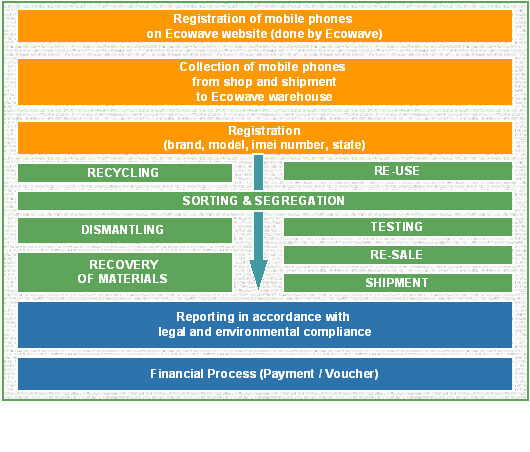 Ecowave processes the devices in compliance with the arrangements made and applies a rigorous selection when choosing between re-use and recycling. In this way we ensure less environmental impact. With the products, which can be re-used, we can help people in the less prosperous parts of the world. Many devices will find their way to these countries, which are still in development. Your old devices will contribute to the growth of the economy there. Products that are no longer qualified for re-use, will be collected and offered per batch to our recycling partner, where the devices are dismantled professionally. Approximately 95% of the materials can be recovered for re-use in producing new products. Mobile phones consist of many different materials, including rare metals and minerals, like cobalt and coltan. These are just two of the many material of which a mobile phone consists. Did you know that from 1.000 kilograms of mobile phones (without batteries), 140 kilograms of copper, 3.14 kilograms of silver, 300 grams of gold, 130 grams of palladium and 3 grams of platinum can be achieved? In these same 1.000 kilograms of mobile phones one can extract 20 times more gold than in 1.000 kilograms of gold ore.
By re-use or recycling you will give the discarded mobile phones a better future instead of ending up in the waste bin. Thus, help to make the growth of the heap as small as possible and contact us today.